When my husband, Al, and I moved to the Valley 10 years ago, we declared that we would be pet free. In the three years prior to our move from Northern Virginia we had buried three cats – cats that we loved and had been close companions. But our family thought differently. They thought because we knew nobody in the Valley we would be lonely. So as soon as we finished unpacking, early one morning my grandson arrived with a cat carrier, complete with kitten, a littter pan and bag of litter and a bag of “kittten chow”. “Mom said to bring this to you and not bring them back” was his message. So, we now had a kitten. He adjusted to us immediately and we named him “Tiger” because of his beautiful striped markings. He and Al bonded immediately. His favorite sleeping place was either on Al’s shoulder in the recliner or between his ankles on the bed. There was no question about whose cat he was. As the weather warmed up and we let him outside, he began exploring. He instinctively knew the boundaries of our property and when neighbors walked their dogs, he bounded to the sidewalk and somehow conveyed to them that they were not to cross the line. A full size Schnauzer was so intimidated by him, that she would force her owners to cross the to the other side of the street as they approached our house. Tiger soon discovered the storm sewer network under the street and would disappear into the drain near our house and reappear several houses away, which really concerned Al. But there was no way to prevent him from playing in what he considered his private playground. At least he came home in response to Al’s whistle. Often when Al went on his daily walk down to the bottom of Chrystal Hill, Tiger accompanied him part of the way until Al made him turn back. Then he would sit on our sidewalk and watch for Al to return. They were true companions. I became involved in several Volunteer activities so they were frequently alone at the house. Al spent his time reading or watching sports on TV and Tiger was always nearby. After about three years, I decided Tiger needed a kitten to play with. but I failed to consult him. A neighbor had a female cat who was producing a litter of kittens about once a year, thanks to a big long-haired yellow cat that begam roaming the neighborhood. Tiger considered him a trespassser (like the occasional dogs that came by) and they became serious enemies. When the neighbor’s cat produced a female kitten with tiger stripes and a few white markings, I brought it home and introduced it to Tiger. At first, he would have nothing to do with her, but he learned to tolerate her. When she got old enough to venure outside, Tiger became her protector and made sure she stayed within her boundaries. I named her Priscilla, but we call her Prissy. Tiger had become used to having the run of the house, but when I brought Prissy in, I installed her in the master bedroom until she became litter-trained. From that time on, Tiger would not enter my bedroom. They eventually each staked out their sleeping quarters in the house and respected each other’s space; the same with their eating corners. We have always allowed Tiger to come and go via the garage door which we would leave up a few inches until bedtime. Sometimes Prissy would follow him into the garage. One evening there was a cat fight in the garage and we saw the big yellow cat running away. Tiger came in with a bloody eye and Prissy came in shaking and ran and hid. The next day we took Tiger to the Vet and were told he didn’t think he could save his eye. So I bathed it and put drops in it several times a day and gave him antibiotic pills while Al held him and talked soothingly to him. But when the Vet rechcecked him, he told us that the eye was full of cancer and would have to be removed. He adapted very quickly to being “half-sighted”, but his wandering days seemed to be over and he became more contented to stay home. This gave him and Al more time to keep each other company. As Tiger and Prissy became more tolerant of each other, they eventually established a “play” routine. I think it was partly to garner our attention and entertain us. While we sat down to watch TV news and game shows, they assembled in the family room, Prissy on the foot stool near Al and Tiger on the floor nearby. First they engaged in a staring session, then, apparently one would signal with a twitch of an ear and the fun began. They raced though the house, over furniture, under furniture, sliding on rugs, occasionally tackeling each other and rolling around on the floor. This usually lasted 10 or 15 minutes until they would each flop down, tail wagging slowly until they fell asleep. When bedtime came, Prissy got on my bed and Tiger got on Al’s bed. If one of them happened to be outside at bedtime, the other one would not settle down and would parade from one door to the other until everyone was safely in the house. Tiger beacame very protective of Prissy whenever the yellow cat came prowling around. Neither cat particularly appreciated visitors and after an initial greeting, would disappear for the duration of the visit. 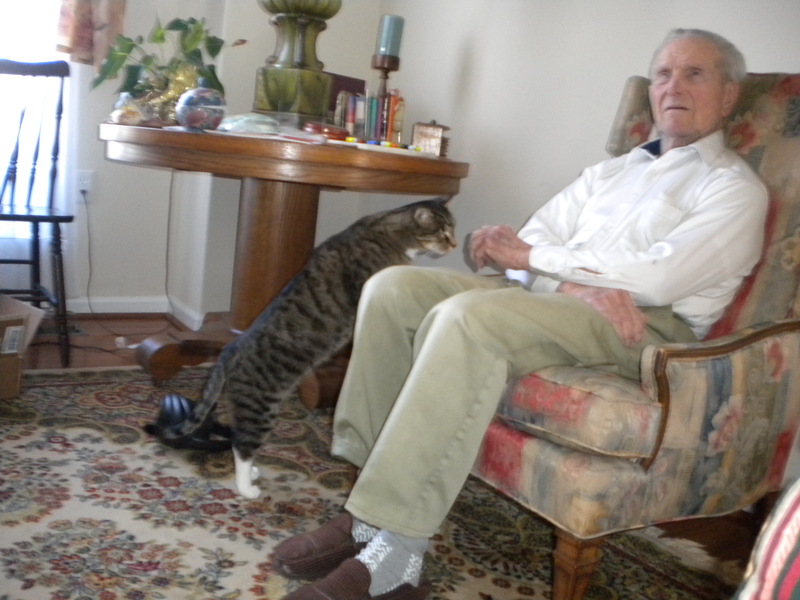 After Christmas, as Al’s health and energy began declining, Tiger spent more and more time with him, either on the bed or in the chair – but never far from his side. When Al began sleeping more each day, so did Tiger – sometimes only leaving the bed long enough to eat and make a quick trip outside. The day I had to call the Rescue Squad to transport Al to the hospital, Tiger would not leave the bed when the Paramedics were attempting to transfer Al to the stretcher. I had to physically pick him up and remove him. The whole time Al was in the hospital, Tiger was miserable. He roamed the house, checking all the rooms and periodically staring out windows and doors. When the ambulance returned Al home, Tiger wasted no time getting up on the bed as the paramedics settled him in. He became a permanent ficture at Al’s side and did not even move when the Hospice nurses were attending to Al. And when Al was conscious, he would stroke Tiger’s head. Nurses and visitors came and went, but Tiger kept a constant vigil for the remaining few days. I didn’t have to explain anything to him – he sensed what was happening. As I attempt to put my thoughts on paper, I realize the depth of the love that they shared. After Al was gone, Tiger searched the house many times – for at least two weeks, returning to Al’s bed to sleep. Finally, he seemed to accept the fact that this was permanent and turned his attention to me. Suddenly he was “my” cat again and now he is constantly at my feet, on my lap or in my bed, as we comfort each other. If I sit in my chair to read or just ponder, he sits in my lap and occasionally raises a paw to my cheek and looks into my eyes. Yes, it was a real love triangle.